Re all the ‘lost’ Lewisham Council CCTV evidence and that Lewisham police knew full well it was ‘lost’ but kept lying about it to discredit me and cover-up their failures to take action. However, as the Metropolitan Police Service has covered-up my complaints I am posting the following to prove Lewisham police knew Lewisham Council ‘lost’ all this CCTV but knowingly and deliberately lied about it, to discredit me and cover-up their failures/refusals to act. The following proves both Lewisham Police and Lewisham Council knew full well re ‘lost’ evidence of incidents…yet both told the self-same lie about it…so the only reasonable conclusion is that they must have colluded to tell the same lie. the truth, as they both knew full well, was that CCTV had been installed but they refused/failed to retrieve the footage. their lie has been told to my MP, it was told in an MG11 and Case Summary to maliciously prosecute me, it was used to maliciously refer me to mental health services, it was even repeated to me by the IPCC in their letter refusing my complaint Appeal, and still in 2013 it was being repeated in Lewisham police records to discredit me . On 18/10/10, after I made my complaint to Lewisham Council, they installed an overt camera on the lamp-post opposite – but it was not working properly all the time it was in place so there was no footage of all the incidents I had reported during this time in the belief the camera was working properly. It is notable that the incidents continued while that overt camera was in place, clearly visible, as if the perpetrators knew the camera was not working. … I see from your email you say your Inspector has spoken to Gary Connors, was this about the footage from the camera (which I thought you were going to speak to him about)? …you might recall I asked about this footage being checked regarding the latest harassment incidents…have you been able to view the footage of the incidents yet? On 21/12/10 the overt camera was removed and Lewisham Council installed two covert cameras in my front bedroom. 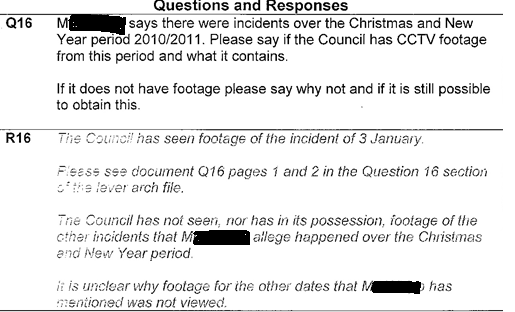 During all this period the Council retrieved footage for only one incident I reported ie 03/01/11…they themselves described the footage as “poor quality” and I have an audio recording of them describing it as “very poor quality” (see ‘Summary’ link near top of this post)…this “very poor quality” footage was seen by Lewisham police, it’s the one piece of Council footage for an incident I reported they ever viewed. The next post will prove that Lewisham police also knew about the ‘lost’ CCTV for this period including for the incident on 04 March 2011 – and that I asked them to investigate re all this ‘lost’ CCTV but I was fobbed off and lied to about it.